Protect yourself from unsafe water even in emergencies! The CWR is a stand-alone unit for use when you don’t have access to running water. Simply pour water into the filter and it drips down into the chamber. The world-class UltraGrav ceramic "Metalgon" cartridge plus granulated carbon significantly decrease chlorine, chloramine, chemicals, dirt, sediment, bad taste and—most important when you are using surface water or water from an outdoor spout—parasites and bacteria. The UltraGrav's patented media even removes toxic heavy metals (including lead) and fluoride, a feature that standard ceramics do not have! Silver is baked into the ceramic cartridges to inhibit bacteria growth during storage. Measures 19 1/2" high x 8 1/2" in diameter; collapses down to 13 1/2" for easier storage and transport. Made of stainless steel with water spout. Output is a one gallon per hour. The unit can hold 2 gallons at one time. The four included filters will last for approximately 1,200 gallons. Click here for inside view. Click here for replacement filters. Also available in a 1 1/2-gallon size. 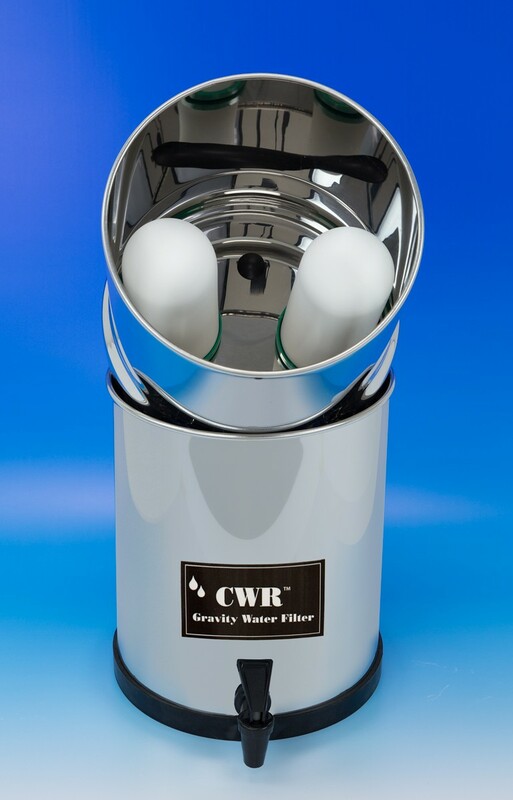 Click here to download a comparison between CWR's UltraGrav filter and other filters.